Kurt Michaelson: How does the church grow? What is a Holy Spirit church? Well, it is a church baptized into his power, and this will be known first by its being devoted. Read the 42nd verse: “They devoted themselves.” He will not bless a church which is excited and then relapses, is carried away by every novelty, and does not know what it believes, but a church which lives in Jesus and in his truth. 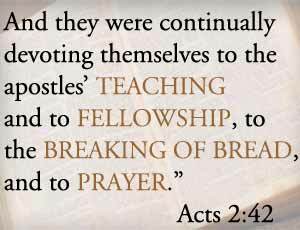 In the apostle's teaching. They were a doctrinal church, they believed in being devoted to the unmovable truth; they did not belong to the shifty generation of men who plead that their views are progressive, and that they cannot hold themselves bound by a ordinary creed. Dear brothers and sisters, never give up the grand old truths of the gospel. Let no excitement, even though it is the whirlwind of a revival, ever sweep you off your feet concerning the great doctrines of the cross. If God does not save men by truth he certainly will not save them by lies, and if the old gospel is not competent to work a revival, then we will do without the revival; we will keep to the old truth, anyhow, come what may! Our flag is nailed to the pole. Next they were devoted in fellowship. They loved each other, and they continued doing so. They conversed with one another about the things of God, and they did not give up the conversation. They helped each other when they were in need, and they continued in such kindness. They were true brethren, and their fellowship was not broken. Next they continued in the breaking of bread, which is a delightful ordinance, and never to be despised or underestimated. As often as they could they celebrated the death of Christ, until he would come again. They delighted the dear memorials of his sacred passion, both in the church and from house to house. They also remained devoted in prayer. Mark that! God cannot bless a church which does not pray, and churches must increase in supplication if they would increase in strength. Sacred insistent requests must surround the throne of God, and then the blessing will be given. Oh, children of the heavenly King, you hamper the Spirit and hinder the blessing if you restrain prayer. Here were four points, then, in which the church was devoted, and God blessed it. Note next that it was a united church. We read of them that they were so united that they had all things in common, and they daily continued with one accord in the church. There were no parties among them, no petty strifes and divisions, they loved the Lord too well for that. The Sacred Dove takes his flight when strife comes in. If you divide the church within itself, you also divide it from the mighty operations of the Spirit of God. Be full of love to one another, and then you may expect that God the Holy Spirit will fill you with blessing. They were a generous church as well as a united church. They were so generous that they threw in their property into a common reserve lest any should be in need. They were not communists, they were Christians; and the difference between a communist and a Christian is this-a communist says, “All that is yours is mine;” while a Christian says, “All that is mine is yours;” and that is a very different thing. The one is for getting, and the other is for giving. These believers acted in such a generous spirit one to another, that it seemed as if nobody considered that what he had belonged to himself, but generously gave of it to the necessities of others. I do not believe the Lord will ever bless a stingy church. There are churches whose minister has fearfully questioned how he will even provide food and clothing for his household, and yet these churches are not very poor. There are churches where more is spent per year for cleaning than they spend on the cause of Christ; and where this is the case no great good will be done. The Lord will never bless a synagogue of misers; if they are misers they may keep their worship to themselves, for God is as a generous God, and he loves to have a generous people. Again, these people were in such a condition that their homes were holy places. I want you to notice this, that they were breaking bread from house to house, and ate their food with gladness and singleness of heart. They did not think that religion was meant only for Sundays, and for what men now-a-days call the House of God. Their own houses were houses of God, and their own meals were so mixed and mingled with the Lord's Supper that to this day the most cautious student of the Bible cannot tell when they stopped eating their common meals, and when they began eating the Supper of the Lord. They elevated their meals into diets for worship: they so consecrated everything with prayer and praise that all around them was holiness to the Lord. I wish our houses were, in this way, dedicated to the Lord, so that we worshipped God all day long, and made our homes temples for the living God. A great dignitary not long ago informed us that there is great value in daily prayer in the parish church; he even asserted that, however few might attend, it was more acceptable than any other worship. I suppose that prayer in the parish church with nobody to join in it except the priest and the usher is far more effectual than the largest family gathering in the house at home. This was evidently this gentleman's idea, and I suppose the literature which he was best acquainted with was of such an order as, to have led him to draw that inference. Had he been acquainted with the Bible and such old fashioned books, he would have learned rather differently, and if some one should make him a present of a New Testament, it might perhaps suggest a few new thoughts to him. Does God need a house? He who made the heavens and the earth, does he dwell in temples made with hands? What crass ignorance this is! No house beneath the sky is more holy than the place where a Christian lives, and eats, and drinks, and sleeps, and praises the Lord in all that he does, and there is no worship more heavenly than that which is presented by holy families, devoted to the fear of the Lord. I have already mentioned that they were a praying church, and that accounted greatly for the increase. They were a devout church, a church which did not forget any part of the Lord's will. They were a baptized church, and they were a church that continually celebrated the Lord’s Supper, so we can see that they were obedient to Christ in both ordinances. They were also a joyful church. We find that they ate their food with gladness. Their religion was not of the somber type which comes from doubts and fears. They were believers in a risen Redeemer, and though they knew that they would soon be persecuted, they rejoiced so much that everybody could see heaven shining on their faces, and might have known that they believed in the blessed gospel, for they were a blessed people. They were also a praising church, for it is said they “praised God, and they had favor with all the people.” Oh, may the Lord make this church and all the churches around us to be as holy and joyful as that apostolic community. This is an excerpt from Charles Spurgeon's sermon, Building the Church, preached on April 5, 1874. I enjoyed the post. However, I couldn't tell, at times, if it was scripture or commentary. It makes me think of my own misgivings to the Lord. Pray for me. I have been battling within and I fear that I am always losing. I know I belong to the Lord, so I have faith that I am saved. Hi Mindy, it was actually an excerpt from one of Spurgeon's sermons. I apologize if that wasn't clear when you read it. We'll certainly pray for you as well.